If you haven't read Part 1 of this series, please read it first as this is a continuation of it. The beauty of the Insider BASSlog is that you can enter all the details of your catch without typing anything. Everything is a selection from a finite list. Once you're in the BASSlog, you click "Enter my data" and you will be taken to a screen that allows you to choose the date, the lake, and the lure type. Then, you click the next button and it allows you to select the details of your lure. Then, you select the details of your catch. Below are the details that you would see if you were in the BASSlog. Once you click the "go" button, your catch is recorded. Notice that it also asks you for the number of bass and the average weight. We all know that it is normal to go for hours without a bite, then catch several bass on the same bait under the same conditions at almost the same time. In this case, you can lump several fish together in one post. So you can record a limit of bass in less than a minute. One thing that I believe many first-time BASSlog users fail to notice is that the BASSlog remembers your post, so you don't have to enter all the conditions for every post. Once you make a post, your first two options will remember your selections for your next post. The first is "Same Lake and Date - Same Lure." You choose this option if you catch fish on the same bait, but other factors change. For instance, you may catch several fish on the same topwater lure between first light and 9:00 a.m. Once you post your details for the fish caught from first light to sunup, it takes you back to the details screen (above) and your previous selections are highlighted. So you only need to change the time of day and enter the number and average size of fish caught during the sunup to 9:00 a.m. period. The next option is "Same Lake and Date - Different Lure." If you choose this option, it will take you back to the lure details screen and allow you to add those details. 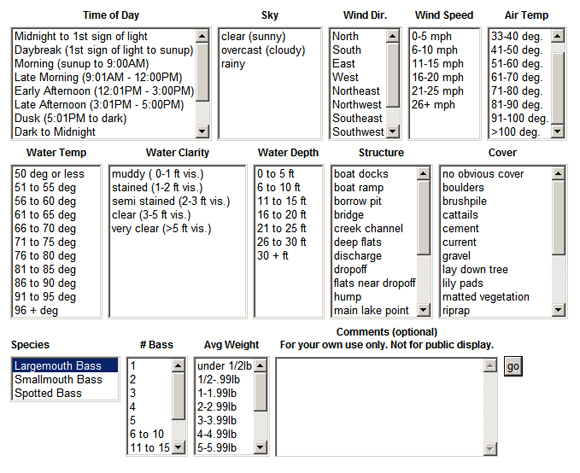 Once you select your lure details, it will take you back to the details screen with all the information from the previous posts highlighted (except number of bass and average weight). So, you only need to click on things that changed from the last post. In many cases, they will be the same. Last time I mentioned that when you select a lure type, it goes to the database and returns the details for that particular bait. I put together a list of what details go with each lure type. Once you're familiar with it, you should be able to record your entire catch in less than 5 minutes. There are only two exceptions to the finite lists. If your lake is not on the list or your lure color isn't listed, you have the option to add them to the list. Other than that, it's all point and click — no typing involved. Next time, I'll discuss the reports and how to take advantage of the information.